NORTH ANDOVER — During her growing up years in Buffalo, N.Y., Karen Kline showed no signs of becoming a poet. When she went to college, she majored in biology. North Andover’s literary tradition carries on. Local poet and community volunteer Karen Kline will be named North Andover’s third poet laureate this July, continuing on the 360-year-long poetic legacy. Kline, one of the founding members of the town’s poet laureate program, learned of her nomination and selection last month during a Board of Selectmen meeting. Selectmen approved of Kline’s new position, which will go into effect on July 1. Karen Kline wants North Andover residents to harvest their heritage. 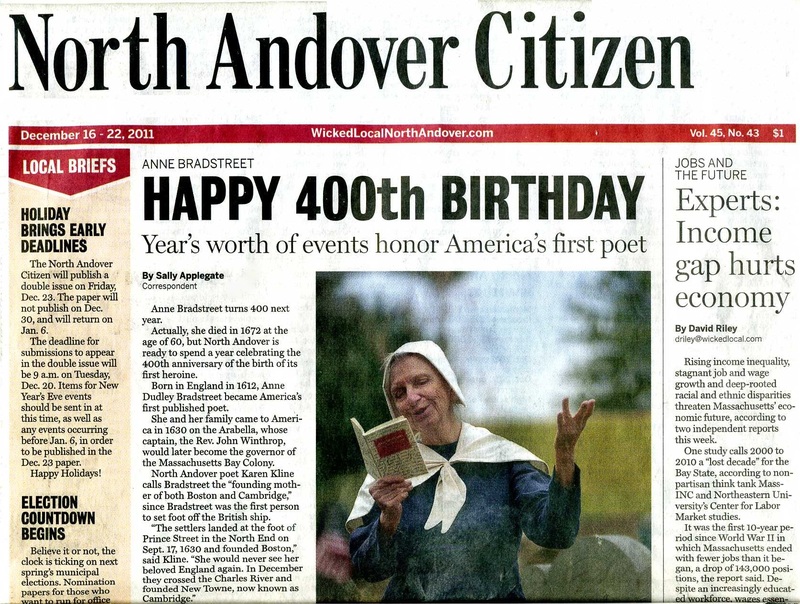 For the longtime supporter of the arts, the 400th anniversary of the birth of poet Anne Dudley Bradstreet, offers an enticing opportunity to raise awareness of Bradstreet’s trailblazing work and the time she spent living in North Andover’s Old Center. 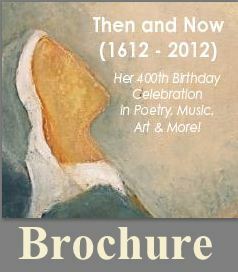 Kline, of North Andover, is spearheading plans for several events to coincide with Bradstreet’s 400th birthday in 2012. Bradstreet was the first published U.S. woman poet. She was born in 1612 in England. She arrived in Salem with her family in 1630, part of a contingent of Puritans, led by Gov. John Winthrop. Bradstreet and family settled in Charlestown and Boston, then Cambridge, where her father and husband were involved with the founding of Harvard College. (The Bradstreet Gate there is named in her honor). Bradstreet came to what was then still called Andover after also living in Ipswich, where she felt at home in a community that enjoyed reading and literature, according to Kline. “She moved to Ipswich very happily because every single home in the town had large libraries,” Kline said. Bradstreet was unique in being a well-educated literate woman, she said, who carved out time for her writing in between being a wife and mother of eight in the often-harsh conditions of the colonies. Kline said she believes Bradstreet is deserving of a place of honor in U.S. history and the arts. She said she is often, sadly, overlooked, or just not that well known. Kline is working to change that. She sees the birthday activities as part of those efforts and she said she is enlisting other supporters to help make this a reality. She’s in discussion with Merrimack College to collaborate with the North Andover based school on the celebrations. The college is also keen to explore Bradstreet’s legacy from a gender studies perspective, she said. There are other key supporters in town, too, including Stevens Memorial Library and the Stevens Estate, she said. Although it’s only early 2011, Kline is already working to put the word out about the celebration and actively soliciting help and ideas. She envisions lots of events during Bradstreet’s 400th year: guest speakers, events, exhibits and more. The valley of the poets? 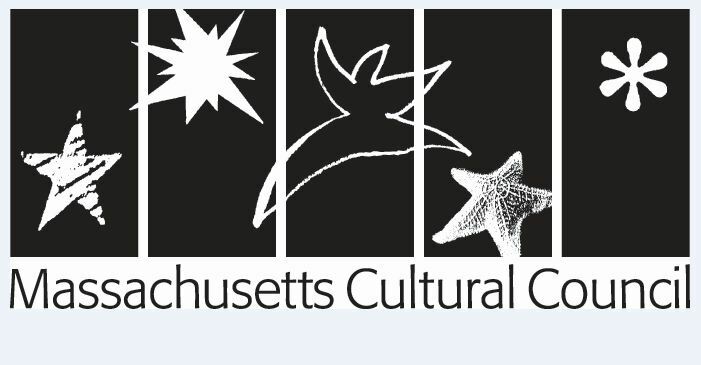 Kline wants to increase awareness of the Merrimack Valley’s rich cultural heritage, to promote the region as an attractive cultural tourism destination and to educate locals about our own history. She wants to capture the imaginations of young and old. Promoting the valley’s literary ties could help promote more tourism and lead to more economic development, she said. It’s a goal Kline has been working toward for years. She’s already persuaded the Board of Selectmen to appoint a poet laureate. 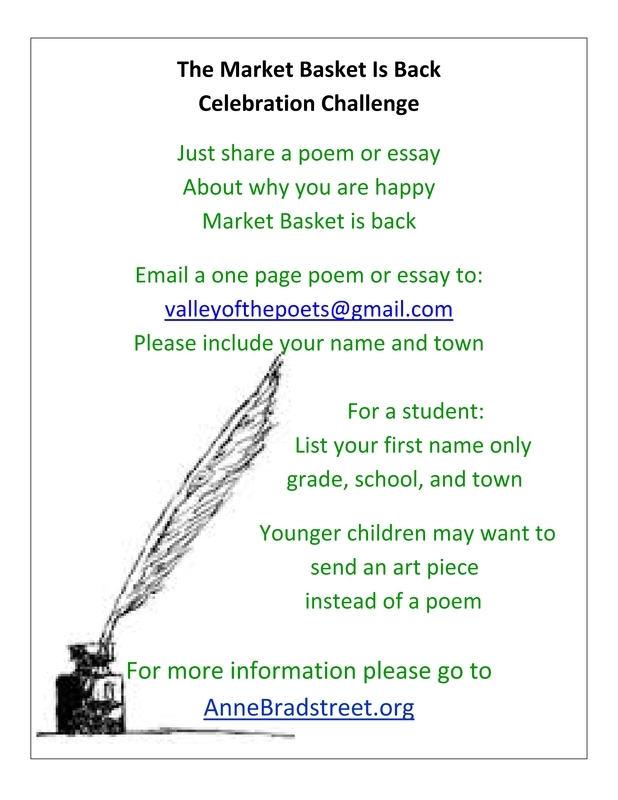 Due in large part to her efforts the town has had a poet laureate since 2006. She is the founder and executive director of American Community Think Tank, which conducts school workshops based on art, literature, media, music and more. She also counsels parents about how to encourage children to embrace writing, art and history. She has worked with the Museum of Printing, North Andover Schools, the Robert Frost Foundation, the Mass. Poetry Foundation, the Essex Heritage Foundation and others. Kline is fond of referring to the Merrimack Valley as the Valley of the Poets because of its long literary history. There’s Bradstreet, but there’s also John Greenleaf Whittier of Haverhill; Jack Kerouac of Lowell; several esteemed writers affiliated with Phillips Academy in Andover, as well as Robert Frost, who graduated from high school in Lawrence, taught in Methuen, lived in Derry, N.H., and highlighted quintessential New England scenes, and manners of speech, in his poetry.